The biggest summer food festival to hit the Midlands! Packed with seasonal produce, ideas for al-fresco entertaining, the UK’s top chefs cooking up fresh recipes live on the numerous stages across the Show, and Pimms and picnics galore. The biggest summer food festival to hit the Midlands! Packed with seasonal produce, ideas for al-fresco entertaining, the UKs top chefs cooking up fresh recipes live on the numerous stages across the Show, and Pimms and picnics galore. 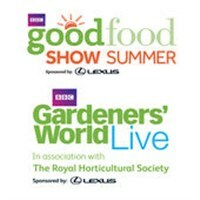 Plus - unique to this Show  your ticket includes you FREE entry to BBC Gardeners World Live, providing a variety of seed to plate inspiration, a vast range of grow your own ingredients and plenty of ideas to get your garden entertaining-ready! There are no barriers between shows, so you are free to wander between the shows at your leisure. The Big Kitchen is the highlight of the Show, where youll experience the very best celebrity chefs cooking delicious dishes live on stage. Mary Berry, Tom Kerridge, Michel Roux Jr, James Martin, Raymond Blanc, and more. Packed full of magic moments and a great atmosphere, youll go home with memories as delicious as the food. Every advance ticket includes a seat in the Good Food Supertheatre where youll experience the very best celebrity chefs cooking delicious dishes live on stage. Packed full of magic moments and a great atmosphere, youll go home with memories as delicious as the food! The ultimate summer day out with fresh seasonal flavours, high-class entertainment and two Shows with one ticket! Theres little more rewarding than cooking a dish using home-grown ingredients - be it a tray of salad leaves on the windowsill, herbs in a pot or tomatoes cascading from a hanging basket by your back door. Use your free entry to BBC Gardeners World Live to find experts including Monty Don and Alan Titchmarsh sharing top tips; an array of plants, seeds, containers and accessories for growing your own tasty produce; and Show Gardens packed with space-savvy and ingenious ways of making the most of every inch, whatever space you have.